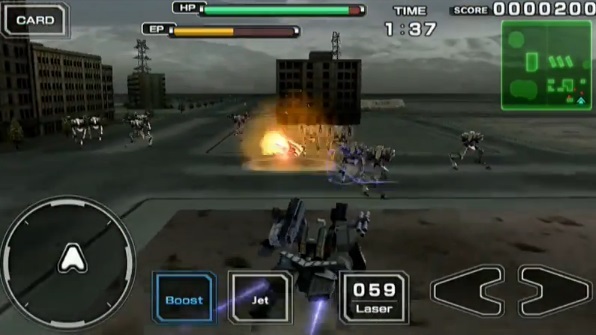 You get to pilot a mech, a giant fighting robot, equip it and send it into missions to destroy other mechs, destroy boss robots, prevent enemies from reaching a target and even against high placed fixed enemy artillery. You have the selection of weapons (missiles, cannons, guns, lasers, grenades and much more, upgrades to armor or speed and various equipment like jamming devices and various enhancers. This game is as gorgeous as it is complex. Sheer fun. Of course, we did manage to find some small caveats (wouldn't be much of a review otherwise ...). You have to earn a lot of money for certain upgrades, which demands a lot of missions. Some people would prefer it if you could reach those upgrades faster, though you have the ability to pay in real money for them. The complexity of this game may daunt some smartphone owners who got used to puzzle solving on the subway, though the missions are usually short in time - two minutes or less. And last but not least, the graphics can be really enjoyed on a tablet with a larger screen, though even on a smartphone the game is great. Score: A whole hearted 5 out of 5. A game so complex and big, it truly deserves to be on an Xbox or PlayStation. 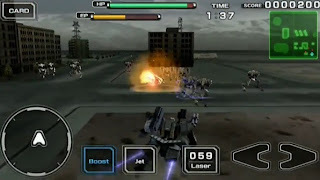 Description: A mech piloting and combat game, this game pits your fighting robot against other mechs, all equipped with a large variety of weapons and all sorts of futuristic war gear. Great 3D graphics, complex physics and a huge assortment of missions, enemies and weapons truly make this game (actually a series) a unique experience. Good Points: Piloting a giant robot! Watching your mech fight your enemies in true colorful 3D. A huge variety of enemies and weapons make for a truly long and worthwhile experience. Tactical thinking is as important as dexterous fingers. Bad Points: Complex game may be a surprise for others used for simpler and smaller Android games. You have to put it a lot of time to reach higher levels and mechs. Sometimes you miss some of the more beautiful graphics on a small smartphone screen. Experience: Since learning of this game's existence, we had our testers download in and install it. All liked it very much, even those who hadn't played previous versions of the game. Very few problems were encountered, even on less powerful smartphones. A very rare crash or two and that's it. Longevity: None of our testers uninstalled it nor do any have any intention of doing it. A really worthwhile game.